One hundred years ago, infectious diseases were the leading cause of death worldwide. In Canada, they now cause less than 5% of all deaths--thanks in part to immunization programs. Immunization has probably saved more lives in Canada in the last 50 years than any other health intervention. Children lined up to receive their needles at an immunization clinic. 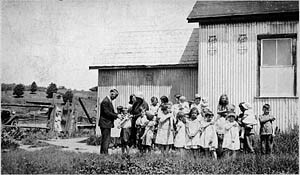 Children lined up: Archives of Ontario. Digital Image Number: I0005225.jpg.